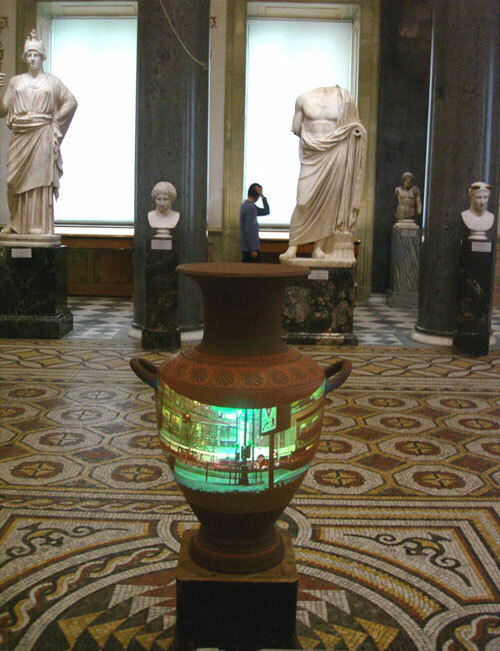 Made in Ancient Greece (2003-2015) is a multimedia installation that constitutes one of the brightest and longstanding projects of the artist. 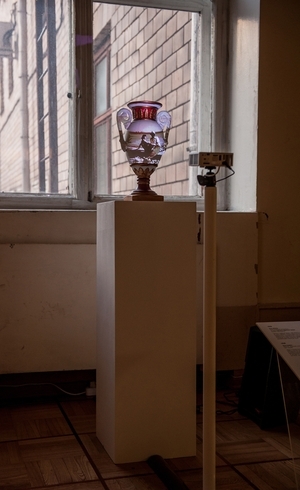 First exhibited in its entirety at the Museum Center of Russian State Humanitarian University in 2015, the installation consists of several works inspired by the antiquity. 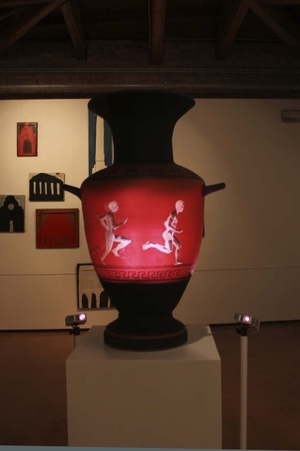 Upon ceramic vessels, whose shape reminds us of the vases from Ancient Greece, there is a projection of video stories from various epochs: running athletes, frames from a family archive, scenes from a modern city life… The selection of projected videos is conditioned by nostalgic intentions of the author, and each work is a certain journey through the imaginary time represented by classical forms, historical images and creative associations. At the same time, art turns out to be even more remote, as it were, from the immediacy of a real event by means of time and space and alienated because of the reflection of life through art. The art still follows that life, but at a certain distance. Known and unknown, "before" and "after", the juxtaposition of big and small - this is what structures the works of this series. The project is both a study and a reflection upon formal and spiritual meanings of the contemporary artistic culture. Storm in a Tea Glass, the last work of the series, follows the same logic, but it suddenly changes outer and inner arrangements of the meanings: from the bottom of a tenfold-magnified ordinary glass (in a podstakannik) from the recent reality of travel in the train cars of a no-longer-existing country, there is an upcoming storm out of Greek tragedies and emerging silhouettes of the ancient Parcae. 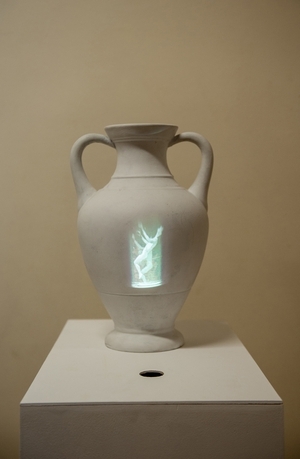 “Made in Ancient Greece, 1928” is second piece from series of freestanding video sculptures that introduces unlikely, from the conservative point of view, but perfect marriage of traditional art form and moving images/ Hollywood style that transformed later to style of Soviet cinema of Stalin era. Ridiculing snobbishness of our conventional thinking, sculpture plays on principles of our vision, time that long term memory takes to pulls out cliches, and perfect proportions of the Greek pottery. Footage was shot in 1928-1936 by young cameraman Vyacheslav Alekseevich Burgov who later became legend of Russian sound technology. 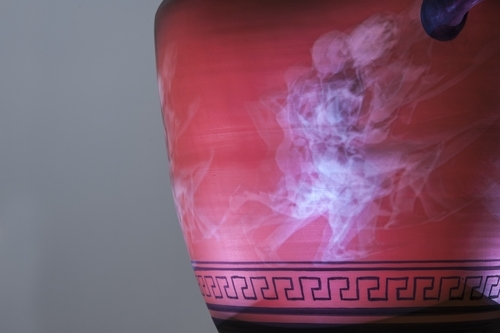 “Made in Ancient Greece” is a freestanding video sculpture that introduces unlikely, from the conservative point of view, but perfect marriage of traditional art form and moving images. Project “Bluest of the Seas” begins with the 90-year-old Signora sharing a story from her past with her granddaughter. Be it bathing in the noon sun or filled with the chirping of cicadas, the Italian town of Maranola, which is rising up from the warm sea, is always resplendent. For its inhabitants, the seascape became some kind of a "Magic Lantern" (Laterna Magica) - a futuristic video with sounds and smells. It was also the means of sustenance in hard times. 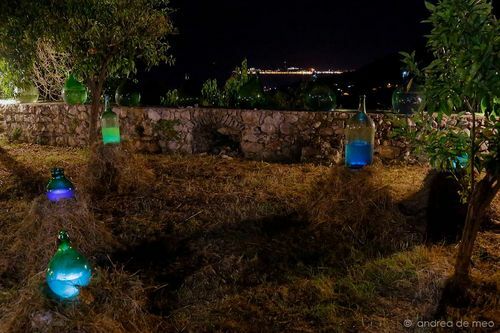 During the Second World War, women from the village used vessels made of thick green glass to bring seawater to the village, walking for 5 kilometers with 30-liter bottles on their heads. Seawater was then boiled down and the salt obtained from this process was transported through the mountains to the places where it could be exchanged for other basic necessities.